You will need an 8” or 20cm round cake tin, greased, with base and side lined plus some baking parchment. Tie a double band of brown paper (or newspaper) around the outside of the tin for extra protection. Get the pre-soak ingredients ready the night before you make the cake. Put all the fruits in a bowl and mix them with the brandy, cover with a cloth and leave them to soak for a minimum of 12 hours. The next day pre-heat the oven to 140°C, gas mark 1. Sift the flour, salt and spices into a bowl. In a large mixing bowl, cream together the sugar and butter till light and fluffy. Add the eggs one at a time until they are all incorporated, scraping down the sides after each addition. Now gradually fold in the treacle, pre-soaked fruit mixture, chopped nuts and finally the grated lemon and orange zests. Take a double layer of baking parchment cut to the size of the tin and cut a 50p-sized hole in the centre (for extra protection during the cooking) and place this not on top of the mixture itself but on the rim of the brown paper. Bake the cake on the lowest shelf of the oven for 4 hours until it feels springy in the centre when lightly touched and a skewer inserted into the cake comes out clean. It can take longer than 4 hours if your oven is slightly cooler, but don’t open the oven door before 4 hours. Once cooled, ‘feed’ it by making small holes in the top and bottom with a cocktail stick and spooning in a couple of tablespoons of Armagnac or brandy, then wrap it in parchment paper and store in an airtight tin for about 6 week. Every week remove the cake from the tin, unwrap and feed with another tablespoon or 2 of brandy or Armagnac. 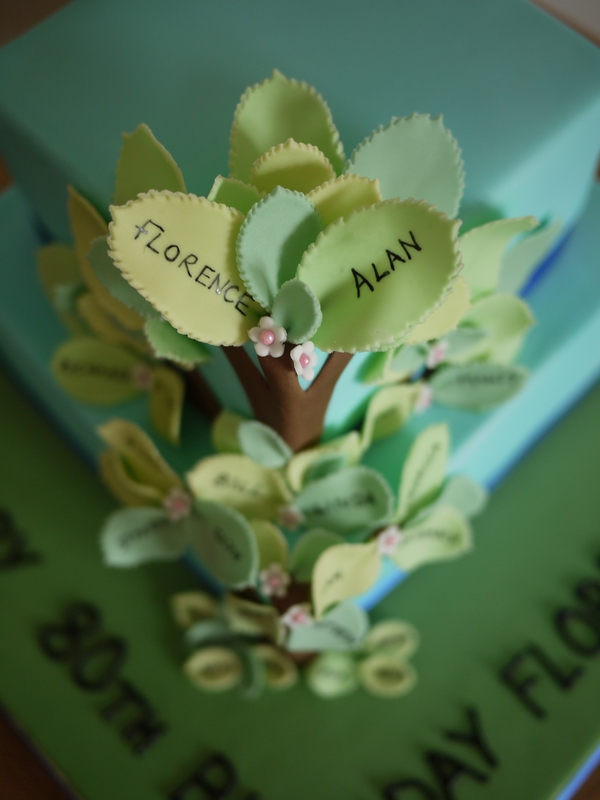 The cake decoration was fairly quick and simple – it just took time to cut out all the leaves and write the names on. 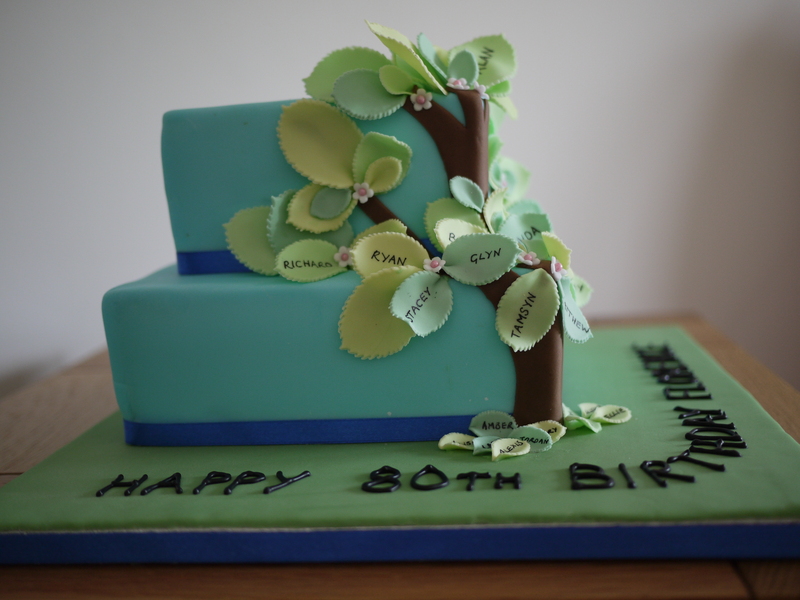 I use sugar florist paste for the leave and coloured it in 3 different shades of green. 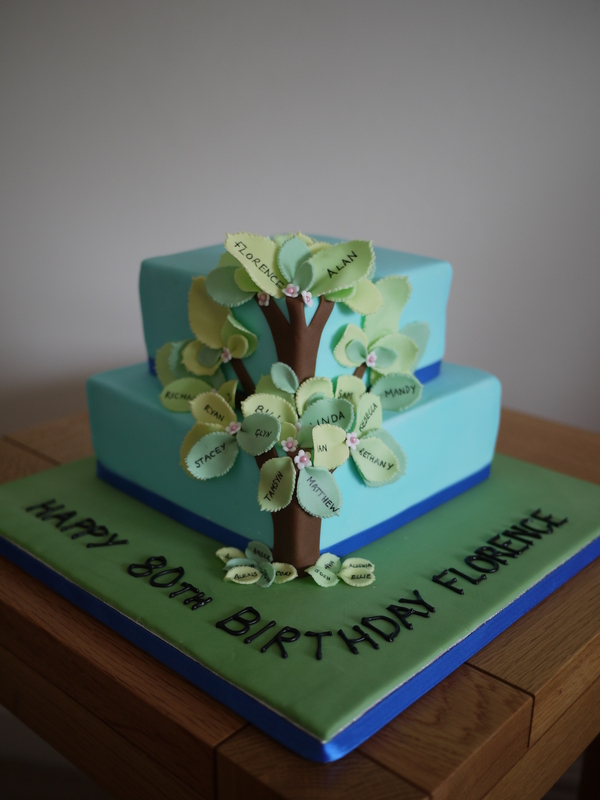 For Beckies Nana and Grandad at the top of the cake, I used a big leave cutter, for the next 2 generations I used a medium cutter and for the great grandchildren I used a small leaf cutter. Once the leaves had been cut out I left them to dry in various shapes, over wooden spoons etc to give them shape. 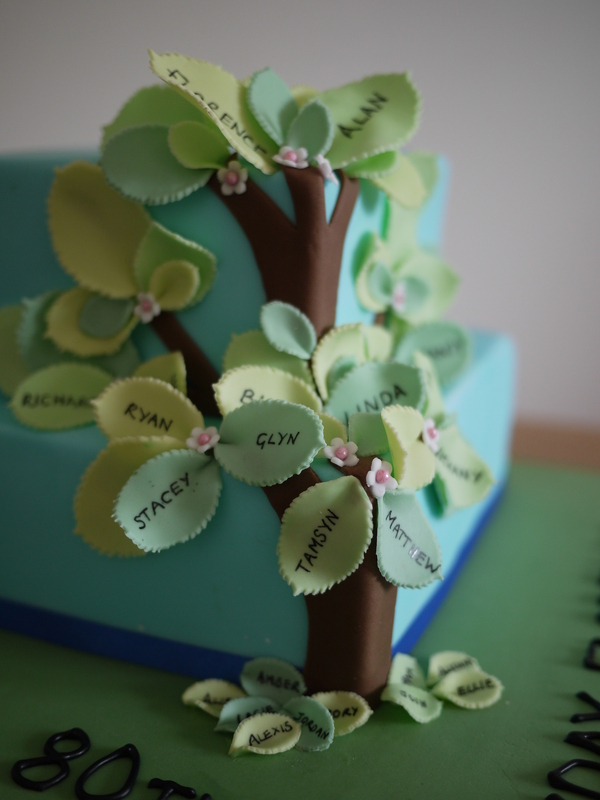 I used an edible pen to write all the names onto the leaves once they had dried. 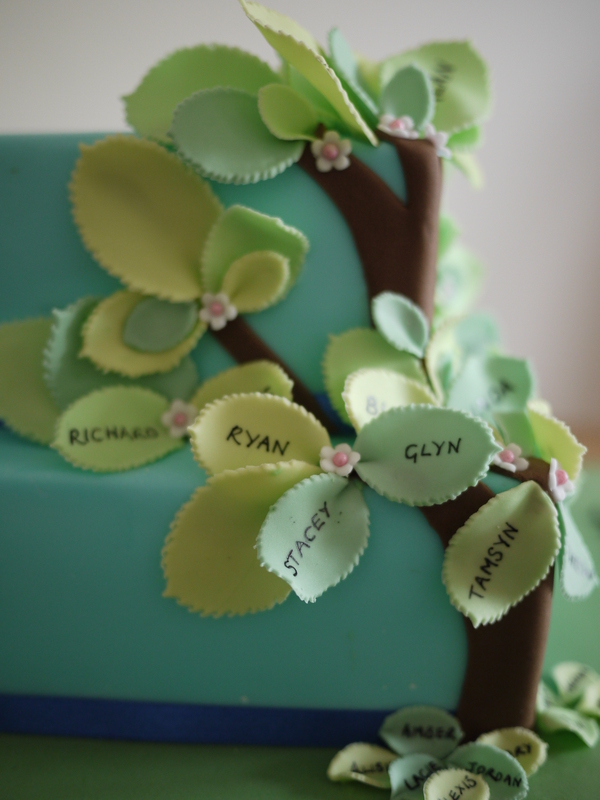 I also made a few small white flowers and added pink balls to the middle to create the blossom on the tree. Royal blue ribbon was added and a happy Birthday message was piped onto the board to add the finishing touches.